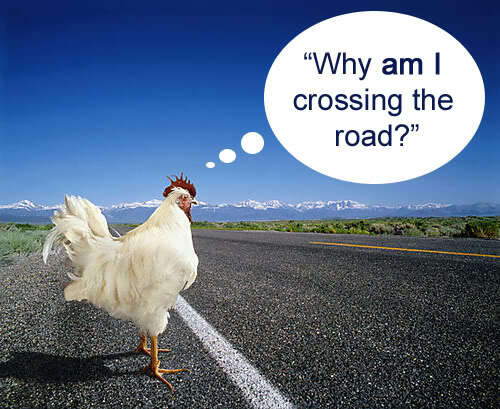 Why Didn’t The Chicken Cross The Road? To answer the question – it’s because it marched to a different drumstick!! And on that same day when it decided not to cross it sat down on the side of the road and decided to stare off into the unknown distance. She just stared and stared and stared and then something happened. A sudden realization came over her. She wondered if the chickens before her who crossed the road really knew what they were doing, or if they did it because that’s what was always done. And she came to know that despite what everyone told her, the grass was not greener on the other side. But she wasn’t happy with the grass where she lay either. And so she walked along the side of the road, not knowing where it would lead her but trusting that it would be to a better place. And that chicken, my friend, is me.